Covenant Presbyterian is a large and vibrant Christian church in Charlotte, NC. Along with the growth of the leadership and congregation, their previous static website had grown to a size that was becoming unmanagable, inconsistent and largely unnavigable. We began the project with a client meeting with the communications team to develop the new site architecture. 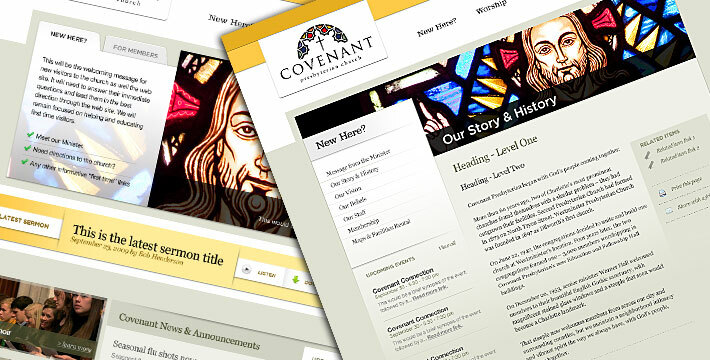 With the main goal of the new site being easier navigation, we worked with the Covenant team to produce a main architecture based on action items that would mean something to a member and visitor. The next step was to present the content in a manner that would make the most sense to visitors and members alike. A members and welcome area, homepage access to the lastest sermon, as well as prominently featuring news, events and promos items were all priorities of the new website. The site is built upon the Expression Engine CMS that gives specific Covenant staff the ability to update specific areas of the site that they are responsible for which spreads the content maintenance across several departments. Just completed recent internal redesign.